I bought a used Kahr CW45 because it was on sale for a very reasonable price. 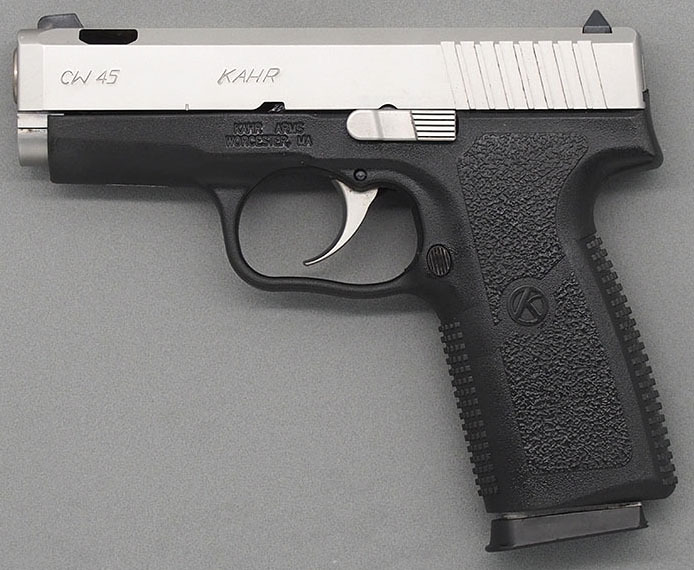 The CW45 is one of Kahr’s economy models. It lacks some of the high-end features like tritium night sights and polygonal rifling found on Kahr’s premium models. But it fits my hand and the price was right. I took it to the range and found that, though it has a lot of muzzle flip, the recoil isn’t bad for a very light pistol chambered for the .45 ACP cartridge, and it is accurate. I made a holster for it and found that it is easy to carry. In comparing it to some of my other concealed carry pistols I found it stacked up rather well. The Kimber K6S .357 magnum revolver weighs in at 28.85 ounces fully loaded with six 125 grain cartridges. The Kahr CW45 weighs 27 ounces fully loaded with seven 230 grain cartridges. Not bad! Since I was planning to carry the CW45 regularly I took it to the range several times to practice and the only problem I had was the muzzle flip--because of its light weight it really jumps when you fire heavy bullets, so it takes more time to reacquire the target for the next shot. I got the idea to have the gun Mag-na-ported. I even searched on line to see if anyone else had tried it, and found one enthusiastic shooter who said it resolved all his issues with the gun. So I went to Mag-na-port International’s website and checked out the prices. The price for a semi-automatic handgun was (in August 2017) $145 plus shipping, and I needed only to ship the barrel and slide, not the whole gun. I decided to give it a try. I shipped the barrel and slide to Mag-na-port and waited for about ten days, then I called them. The lady I talked to quickly found my order, gave me my order number, and provided me with the price including tax and shipping. I put a check in the mail that day. From the day I shipped to the day I received my ported barrel and slide back totaled 23 days. I was completely amazed and pleased with the results. The gun has virtually no barrel flip now and (this may be totally subjective) the gun feels like it has less recoil. If I may be allowed a cliche, the difference was like night and day. I tested the gun with various brands of ammunition before and after porting. The porting reduces the effective length of the barrel from 3.6 inches to 2.4 inches. This does not affect the accuracy at all, but it does reduce muzzle velocity and muzzle energy. Depending on the ammunition, I found an average 4% to 8% reduction in muzzle energy. 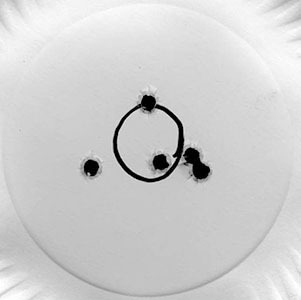 So 185 grain Remington Golden Saber ammunition (from the same box) went from an average 944 feet per second, with 368 foot-pounds of energy before porting to an average 915 feet per second, with 345 foot-pounds of energy after porting. I won’t give details for all the other ammunition I tested, but I will say that I ultimately chose the 230 grain Federal Hydra Shok ammunition to carry in the gun. Its recoil is quite manageable and it turned out to be the most accurate of the various brands I tested. After porting, in the CW45 it averages 813 feet per second and gives 339 foot-pounds of energy at the muzzle. For the time being, the Mag-na-ported CW45 is my new favorite concealed carry gun. Copyright 2017 by Ed Buffaloe. All rights reserved.